Belgium's football association has scrapped its official World Cup song with rapper Damso after he was accused of sexism in his lyrics. The choice of Damso, whose songs detail sexual violence against women and include misogynistic language, was criticised by activists and sponsors. The Royal Belgian Football Association (RBFA) apologised to those who felt offended by their choice and said they had ended the deal in mutual agreement. Damso has not yet commented. 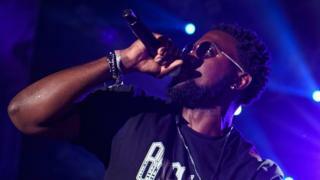 Damso, who is Belgian Congolese, had been chosen to perform a song he had written called Humains during the tournament, which begins in July in Russia. In a letter addressed to RBFA's sponsors, the Women's Council of Belgium described Damso's lyrics as "expressing loathing, abuse and violence towards women to a degree that is quite frankly astonishing." "Damso's promotion to official cheerleader is an endorsement of the sexism he stands for and it's being latched on to a major sporting event broadcast the world over," it said. After the announcement, Damso published a clip of the song on Twitter with no comment. Borussia Dortmund's Michy Batshuayi, who plays for Belgium, has shown his support for Damso's song, retweeting the clip the artist published. Damso is signed to Universal Records, which refused to comment. Speaking to the BBC, the RBFA said: "For a few reasons we thought it would be a good choice - he was a young man from an immigrant background." Criticism also came from sponsors Coca-Cola, Proximus and Adidas and several politicians, including Deputy Prime Minister Alexander De Croo. "I think it's kind of surprising that they [RBFA] had not thought about this," Mr De Croo told the BBC. "I would imagine that any federation of this size and importance in Belgium would do this with proper due diligence." He said Damso's background resonated with many young people but it did not "mean you can insult women and be put on a podium to do so". "I have two boys who love the national team," he added. "I wouldn't like them to adore these lyrics because of their association with the national team… I don't think these types of lyrics should be given legitimacy based on this."